Every Saturday I sit down and menu plan for the week. I usually try to make a plan for Sunday through Friday. I rarely ever plan anything for Saturday because it never fails that one day during the week we either eat leftovers, or we are out, or something happens and I have to shift everything over a day. If that doesn’t happen then we generally go out to dinner on Saturday. In the summer I have a much harder time. I try to look at the weather and figure out when we can grill out, when it’ll be cool enough to turn on the oven, and when we should cook on the stove top. The result is that most times in the summer we shift many of the days around or just end up eating a cold plate for dinner. It’s just hard to plan around the rain and the heat. A few weeks ago I had buffalo chicken and fries on the menu. The plan was to cook them in the oven because it was supposed to be in the low 70’s the day I had it planned for. As the week went on it heated up more than it was supposed to and the day for chicken and fries ended up being hot, sunny, and in the 80’s. There was no way I was turning on the oven. After a quick glance in the refrigerator I realized I could easily make Chicken Caesar Salads. While it sounded good to me I was worried it wouldn’t be filling enough without a starch or bread. I looked through the cupboards again and came up with the idea to put pasta in the salad. When I worked at an Italian restaurant we put pasta in our salads and I loved it so I figured why not try it in this salad? So I started on my Chicken Caesar Salad with Pasta. I made a quick and easy homemade dressing that wasn’t too heavy. The vinegar and lemon juice really help to thin it out. I sprinkled the chicken with salt, pepper, and oregano and sauteed it in a skillet while I cooked the pasta on the stove top. We had just picked up lettuce at the farmer’s market so I cleaned and chopped that and threw it in a bowl. I tossed everything together in a bowl and mixed it with the homemade dressing and I had a beautifully dressed entree salad ready in under 30 minutes. 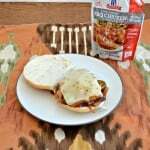 This was a delicious and filling meal that was great for summertime. 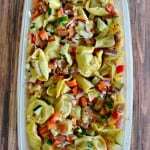 The chicken and pasta can both be cooked ahead of time to cut down on prep time. The salad was light and refreshing even with the creamy dressing. 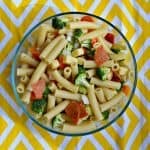 It would also be good as an appetizer salad for a crowd at a cookout or picnic. 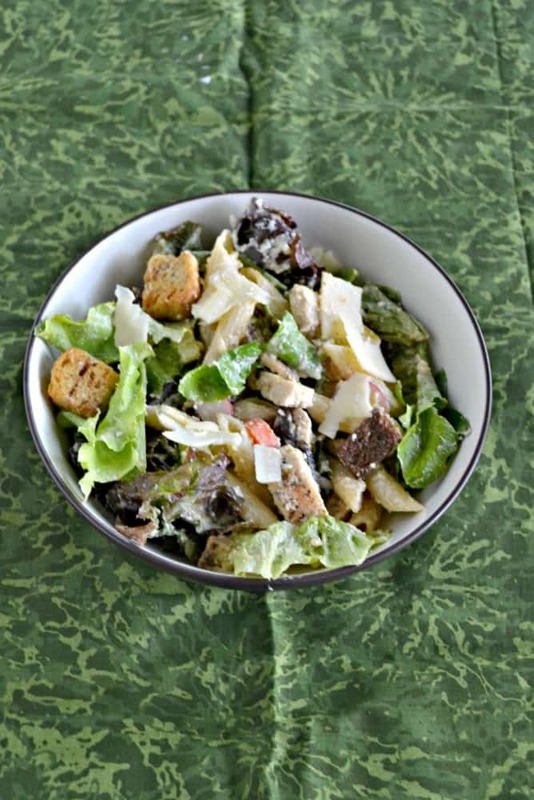 Enjoy a delicious summer salad with chicken, pasta, Parmesan cheese, and homemade Caesar salad dressing. Combine all the ingredients for the dressing in a medium bowl and whisk until combined. Set aside. 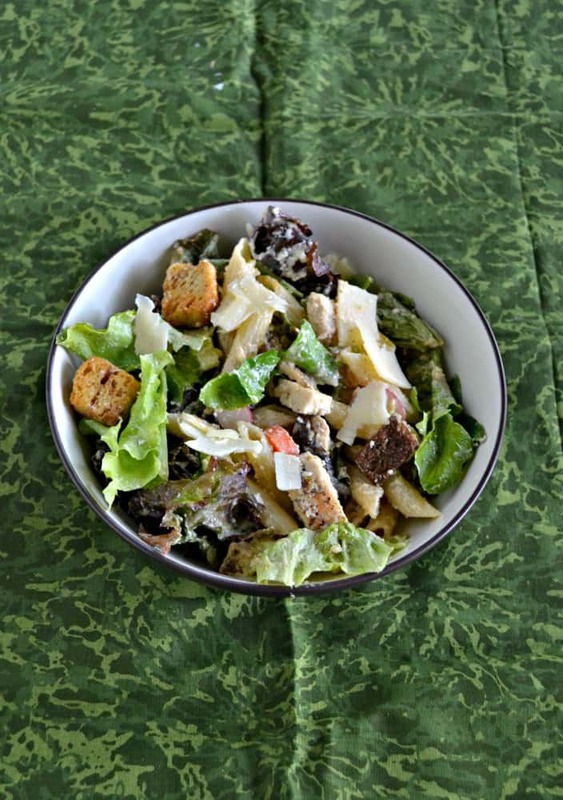 In a large bowl combine the lettuce, red onion, bell peppers, pasta, chicken, croutons, and grated Parmesan cheese. Toss to combine. 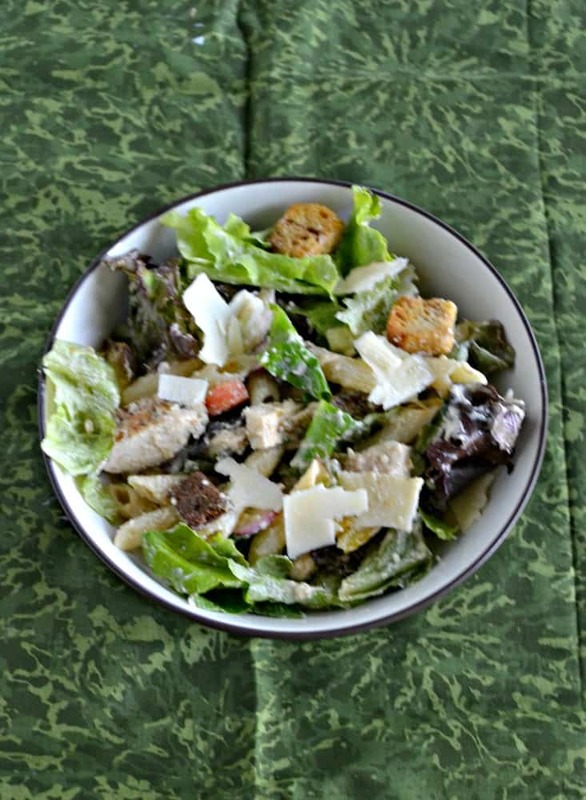 Add half of the Caesar salad dressing to the salad bowl and toss to combine. 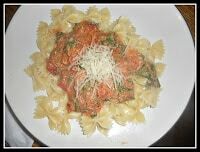 Place the shaved Parmesan on top of the salad and serve with extra Caesar dressing on the side.